Thank you to everyone who helped make the 2013 Vermont QSO Party a rousing success! Outside Vermont, a total 65 logs were submitted and these contained 363 QSO's with Vermont stations. This is a big increase over the 38 logs with 175 QSO's. Logs eventually came in from 29 states, 4 provinces and 5 DX countries! In the Vermont competition, certificates will go out to the top 5 Single-op finishers and top Multi-op and Mobile-op finishers. In addition, all Vermont stations making over 100 QSO’s will also get a certificate. 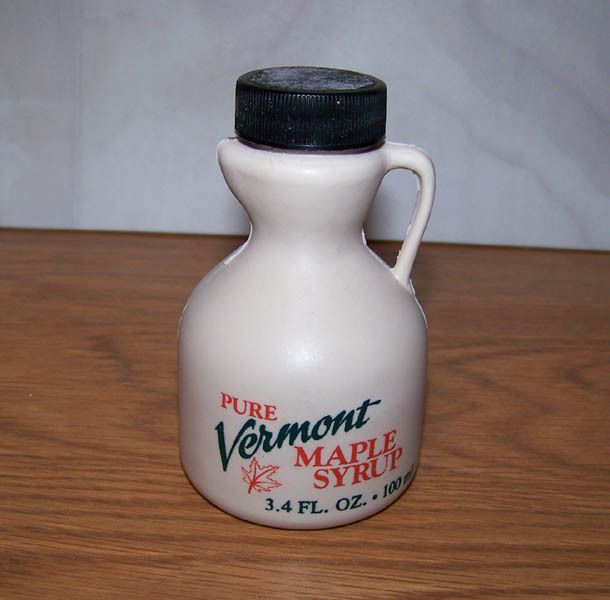 In the Outside Vermont competition, the “grand prize” for the 2013 Vermont QSO Party is a souvenir 3.4 oz jug of genuine Vermont Maple Syrup which goes to the top 3 Outside Vermont finishers. You guys worked hard for those contacts and we recognize you with a product which is uniquely Vermont. If you’ve never had Maple Syrup before, it is very sweet and very concentrated, so a little goes a long way! Here in Vermont it is the breakfast topping of choice on pancakes, waffles or jacked deer steak (!?). Enjoy! Certificates will also go out to the top 5 stations and stations working 10 or more QSO’s. Vermont stations fell into 3 categories: Single Op, Multi-Op and Mobile-Op. The Host Club, W1NVT was not in competition and was there to make Vermont easily available for most of the QSO Party. The station was active 1300-0400 UTC, on phone only, primarily on 20, 40 and 15 meters, with a little bit 10 and 80 meters tossed in as well. Six different operators (W1SJ, AA1SU, KB1VJD, KB1WDM, KB1THX, KB1WXM) of various skill levels manned the controls and all did a bang up job. There were monster DX runs on both days, on both 15 and 20 meters. The stateside run was tremendous on Saturday too. With W1NVT showing up in virtually every submitted phone log, we knew that the mission of putting Vermont out there was accomplished. In the single operator competition, Bob KB1FRW repeats as Vermont QSO Party champion with a decisive victory. He had big runs both days on 20 meters, and filled in local multipliers on 40 and 2 meters. Second place goes to again David K4TT who used a mix of Phone and CW and big multiplier totals. He started off on high power but lost the amp in the early going. So, he just submitted the low power contacts to claim the 2x multiplier and did a tremendous job. Joe K1VMT moved up a notch from fourth place last year to third place with big runs on 15 and 20 meters. Phil WA1ZAM did something out of the ordinary. He operated exclusively on RTTY (something he says we won't do again!). But it worked, as he claimed forth place running low power to a wire antenna. Zach K1ZK again put his club call WB1MG on the air and provided another bonus multiplier for others to work. He started later Saturday, missing the morning run, but used a combination of phone and CW to run up a tidy score and claim fifth place. Scores were tightly bunched in the next few slots, with Arnie W2HDI running high power on all three modes grabbing 6th and new ham Steve W1SFR grabbing 7th. Steve was a Technician during the QSO Party made all of his contacts on CW. Way to go! In the Multi-op division, Randy N1SP and Mary AB1BB did a husband/wife multi as N1SP and turned in a top flight score. In the Mobile Division, Carl AB1DD took to the highway to make a bunch of QSO's.